An engagement ring should represent your love and commitment to your partner so choosing the ring can be daunting. Our guide aims to help you with the key decisions such as size, shape, setting and budget. This is a big decision and should be the first step in choosing your ring. Tradition suggests an investment of between one and three month’s salary but at Jason Keith we think it is most important to spend what you are comfortable with. Once you have a budget in mind a great second step is to choose a setting. Jason Keith recommend picking a setting prior to the diamond as you can choose a setting and then opt for a diamond that compliments it. It is also an advantage as you can work out how much money you have left for the diamond. The two main types of setting are claw and bezel, with claw being the most popular. This setting holds the diamond in place with ‘claws’. You can have up to 8 claws to hold your diamond in place. This style of setting allows light to freely travel through and around the diamond ensuring maximum brilliance and sparkle is achieved. It also draws emphasis to the most important part of the ring, the diamond. The amount of claws you have is determined by the shape of the diamond and personal taste. 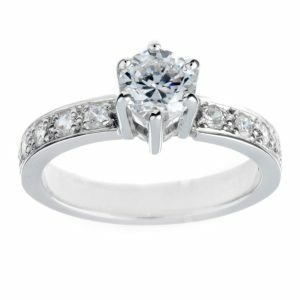 This setting creates a rim or collar around the diamond, the main difference between it and a claw setting is its style. Although claw settings are more popular the bezel setting could be described as more modern or contemporary. The bezel setting offers better protection to your diamond and so is recommended for people with active lives. 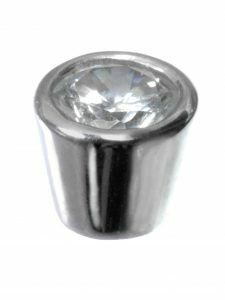 Another option for your ring is to add side diamonds, these can really set your ring apart. The aim of them is not to distract from the main diamond but to aid in its allure. Below are just some examples of rings with side diamonds that Jason Keith has designed and created. The obvious choice and by far the most popular is diamond, but Jason Keith can use any rock you desire, maybe your girlfriend has dropped hints that she would like something different?! Generally though you can’t go wrong with a girl’s best friend–the diamond. 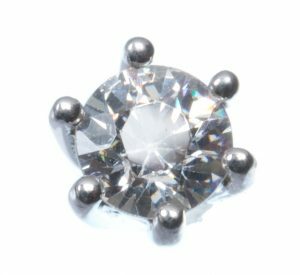 For a more comprehensive guide on picking what diamond please see the diamond guide. Jason Keith works with both gold and platinum. A good starter point would be to choose a colour and often based on what your partner already wears. 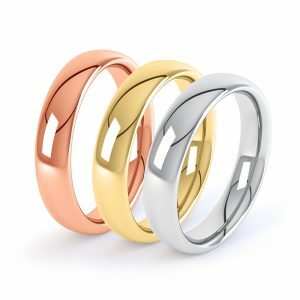 The options include yellow gold, rose gold, white gold and platinum. The most popular trend at the moment is white (White Gold or Platinum). White gold is a silvery grey in colour and platinum is virtually the same. Yellow, rose and white gold are all ‘real’ gold. When gold is used to make jewellery, pure gold is not used as it is too soft. Instead alloys of other metals such as silver, palladium and coper are added to it. It is the type of alloy used that determines the gold’s colour. All colours retain the same percentage of pure gold and therefore both their cost and quality characteristics are very similar. The percentage of pure gold determines the carat (not to be confused with carat, a diamonds weight). Jason Keith recommend using 18 carat (18ct) gold, it contains 75% pure gold and is the best quality for making rings. If a cheaper option is specifically requested, we can use 9ct (which is 38% pure gold). Higher carats such as 22ct are too soft for making diamond jewellery and so are not recommended. In short, platinum is a more precious, hardwearing, heavier and expensive metal than white gold. It also remains white and shiny for its lifetime unlike white gold. The process of making white gold ‘white’ includes a plating of rhodium. This plating gives white gold a better initial shine in comparison to platinum, however, this plating wears off over time. As white gold is made from pure gold, as the plating wears off a tinge of yellow will be seen. We therefore recommend that white gold is re-plated approximately every 18 months. 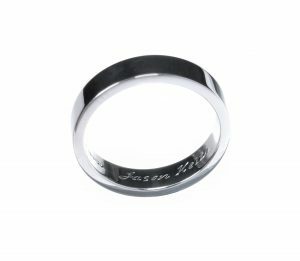 At Jason Keith, engraving is our specialty and lots of our designs incorporate hand engraving making them truly unique to you. From patterns to dates and names just ask; the possibilities are endless.